Image caption Sir Richard Leese said it was a "very clear rejection"
The people of Manchester have voted against having a directly-elected mayor to run their city. The referendum saw 48,593 people vote to retain the status quo, while 42,677 voted to have an elected mayor. The poll had been notable for the lack of campaigning either in favour of an elected mayor or against one. 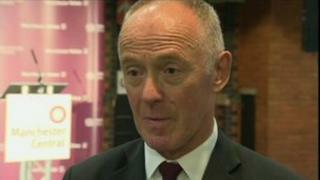 Manchester City Council leader Sir Richard Leese said a majority of almost 6,000 was "a very clear rejection" by the people of Greater Manchester. Labour's Sir Richard said he was ready to keep representing the wishes of voters in the city. "We now need to get on and make it work," he said. The turnout for the referendum was 25%. Had the city voted in favour in the referendum, one of 10 held in England, an election for mayor would have taken place on 15 November.